The long-expected showdown between the Trump administration and the state of California over water, farmers and the Central Valley appears to be imminent. On. Aug. 17, Interior Secretary Ryan Zinke issued a memorandum declaring his staff had 15 days to draft a plan that would increase water for the region’s agricultural industry by reinterpreting relevant federal policies and laws and by targeting “unacceptable conditions” advocated by the state of California. Zinke specifically cited the need to “streamline” the process under which the Endangered Species Act (ESA) and the National Environmental Policy Act are considered and invoked in Central Valley decisions. He wrote that this has prevented long-term changes in federal water decision-making. Behind the bureaucratic language, it appears the Trump administration is taking dead aim at broad water policies that Central Valley House Republicans like Kevin McCarthy and Devin Nunes have long said valued the interests of declining fish populations in the Sacramento-San Joaquin River Delta over the interests of the region’s farmers, who have made the Central Valley the nation’s agricultural breadbasket. But even if the Zinke deadline is met and the Interior Department has new water allocation rules and policies in place by the Sept. 1 deadline, quick change seems unlikely. That’s because environmental groups which have fought previous changes sought by the previous Republican presidents, in particular George W. Bush, have long found judges to be sympathetic to their interpretation of the ESA. A significant number of moderate GOP lawmakers also oppose major changes in existing green regulations. The green coalition contends that the health of salmon and Delta smelt in Central Valley waterways and rivers is a proxy for the health of Northern California’s ecosystem. Greens say that giving more water to farmers by diverting some of the fresh water now pumped into the Sacramento-San Joaquin River Delta could lead to a disaster that affects the whole state – very much including the 19 million residents who deeply rely on water from the rest of the state that’s distributed by the giant Metropolitan Water District of Southern California. Trump’s promises to Central Valley farmers during an August 2016 campaign appearance in the region foreshadowed Zinke’s order. But a more specific, recent cause may have been farmers’ complaints about the California State Water Resources Board, which took two days of public testimony last week on its plan to increase water pumped into the Sacramento-San Joaquin River Delta from February to June to shore up endangered salmon. 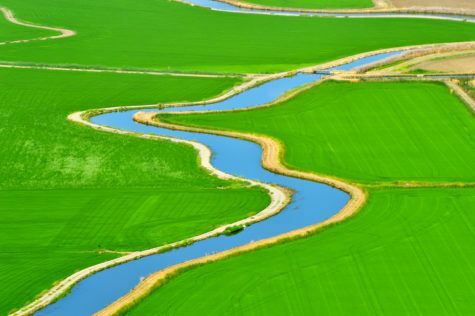 Just as environmentalists threaten legal action over how federal decisions affect Central Valley water use, those aligned with farmers vow court fights over the proposed state policy change. While Trump was nearly doubled up in 2016 California voting by Democrat Hillary Clinton, he ran far better in farm regions. He won easily in the two counties with the state’s largest agricultural economies, taking Kern County by 55 percent to 40 percent and Tulare County by 53 percent to 41 percent.